OK, we know every guidebook tells you about it and its not really off the beaten path but going to the locks is one of my most favorite things to do in the whole city. It is fascinating. 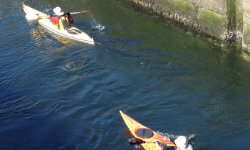 Here you can watch boats get raised up and down between the ocean and salt water, watch kayaker’s glide through the water and in the season see salmon jump. A visit below the ground to the viewing window at the fish ladder lets you see the salmon swimming upstream to spawn. As if that isn’t enough, you might see a sea lion hoping to catch dinner and there is a botanical garden and great lawn to have a picnic on while watching the show. A visitors center tells you all about the locks and the role they play with Lake Washington and Puget Sound. Note, there are also some great fish and chips places there as well. We are a fan of the Lockspot, a bit of a dive but they have been there forever, have great fish and chips, and good beer on tap. They also will sell you a latte to go to warm you up if its a little chilly watching those boats. Trust me, it’s not just the tourists out there, us locals are there with you! Best time to see salmon running is June through October although winter has fish too. Best time for Steelhead Salmon are the last 2 weeks of February and March. And.....it is Free! !